Home prices nationwide, including distressed sales, rose 7.4% year-over-year in November, according to the latest home price index from CoreLogic. This change represents the ninth consecutive month of year-over-year price gains and the largest increase since May 2006. Distressed sales excluded, home prices jumped 6.7% from last year in November 2012. According to CoreLogic’s HPI report, all but six states experienced annual price gains in November: Connecticut, Delaware, Illinois, New Jersey, Pennsylvania and Rhode Island. Conversely, the five states with the highest home price appreciation are Arizona, Nevada, Idaho, North Dakota and California. Home prices, including distressed sales, in December 2012 are expected to rise by 7.9% compared to the previous December, according to the CoreLogic Pending HPI. Without distressed sales, December 2012 house prices could potentially increase by 8.4% year-over-year. 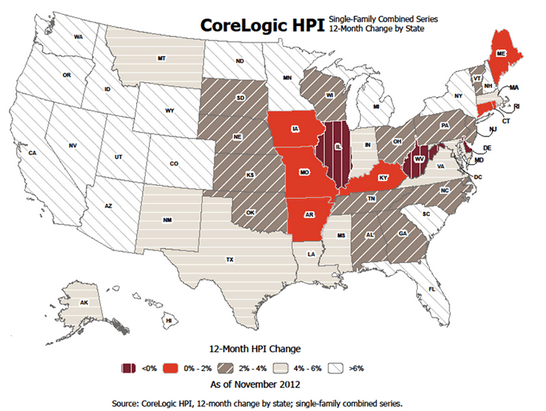 Click on the image below to see a full map of the CoreLogic November HPI numbers. This entry was posted on Tuesday, January 15th, 2013 at 6:08 pm and is filed under Investment Properties, US - RESIDENTIAL NEWS. You can follow any responses to this entry through the RSS 2.0 feed. You can leave a response, or trackback from your own site.